But it can't be from Dolly Clackett. She gave me an Easter egg! : Your landlord called. He says it's not the toilet, it's you. Your landlord called. He says it's not the toilet, it's you. Well well well. Hello, everyone! It's been quite a few days around here, between one thing and another. As I write this, I'm mildly hungover after a lovely afternoon and evening with our friends Rick and Lauren - it turned into a very late night for a school night, but luckily I have been working from home today and that is much more manageable than being hungover in the office. I've been drinking tea and eating bourbon biscuits as if my life depended on it. It's actually been the nicest hangover I've ever had! Sarah has asked me to judge the entries and choose the winners, and as I'll be doing that I'm also going to throw in a special mystery prize of my own. That seems only fair, because Sarah also included me in the spoils - organising a voucher for me from Minerva Crafts! To say that I'm touched by this venture is such an understatement. I don't even know how to begin to express how moved I was by this gesture of affection from my friends in this online sewing community. I have made so many friends - virtual and real-life - through this blog. Learning to sew has helped me to express myself creatively, it's given me a valuable outlet when I've needed it and it's given me access to an incredible community of funny, intelligent, sweet and thoughtful friends. I am truly humbled by the way in which you guys have responded to this idea, and I'm genuinely bowled over that anyone would like to emulate my style. I mean it! You guys mean so, so much to me and I still can't quite believe that this is actually happening. But of course, I can't WAIT to see what people sew!! I was also ridiculously touched that Sarah - and the rest of the dear people she involved - are doing this as a wedding gift to me and Nic. I love that he is interested in and supportive of my hobby, and that he has made friends here too. Thank you all so much! So, I really will be super excited to see what people sew. Sarah is setting up a Flickr pool for the images to be uploaded to and - somewhat hilariously - there's also a #sewdollyclackett hashtag on twitter. And, if you'd like some (ahem) inspiration, you can have a look at my handmade wardrobe tab on this here blog. Anyway - when I got the news, I was outside on my front step getting photos of a recently finished make. Not a dress this time, but another hand-knitted cardigan! Pretty soon after finishing my first Andi Satterlund Miette cardigan, I decided to put the lessons I had learned to practice and get knitting on another one. I bought some navy yarn from a local shop - it's a 25% wool mix and it was pretty pleasant to knit with. After my first one turning out to be so - erm - fitted, I went up a size for this one. The Miette is knitted from the top down, with the idea that you can try it on as you go. I did that but honestly, I didn't think this was going to fit until I had finished the button bands and neckband - up until then, it really felt like it would be a bit too big. But it's not! I'm super happy with both the fit and the length. I found knitting this much easier than my first Miette. This is mainly because, you know, I knew what I was doing and was more confident generally. I think there's also a bit of muscle memory coming into play - On my first Miette I was totally handless. I found the circular needles difficult to get to grips with, but by now I can handle them much more easily. I still made mistakes - misreading the pattern left me having to knit my buttonholes on the wrong side, for example. It makes no difference to me but looking at the photo above, I do think it looks a bit odd. But of course, that could be because I'm aware of it! I bought the buttons from the rag market in Birmingham. They were ridiculously cheap - I think they were 8p each or something stupid. I did buy some more subtle, sensible buttons too but when it came to sewing them on I had to go with these. I mean, come on. Tiny little anchors! Blocking the cardigan widened the buttonholes enough to make the buttons actually usable, too. Hurrah! Those sensible buttons can go on something else, maybe. I made one minor amendment to the pattern - I knitted the waist band and the sleeve cuffs in a 2x2 rib rather than a twisted one, although I stuck to that for the button bands and neckband. As you might be able to see above, my button band sticks out a little bit at the bottom, so I'd have to pay a bit more attention to that in a future one. The other thing is that the lace detail on my cardigan isn't very apparent, even after blocking, and I'm curious to see whether that will be different if I knit it in a 100% natural fibre yarn. Or maybe it's something I'm not doing correctly when it comes to blocking? In any case, it is only curiosity and not disappointment. I'm really thrilled with the cardigan. As I said previously, I'm so happy to have learned how to actually do this. I'm also really pleased by how much better this one is than my first one. Progress, baby! That's a good feeling. And, you know, knitting is fun! I did get a bit of finish-itis with this one in that I knitted the biggest part of it really quickly and then stalled when I was nearly finished the second sleeve, but I gather that's a pretty common phenomenon. I will make another Miette before long. It's a lovely pattern and really enjoyable to knit. I bought some lovely pink cotton yarn over the weekend and have already cast on my next make; an Andi Satterlund Agatha cardigan. I think that will be really fun for spring and it seems like a nice challenge now I feel like I've got Miette figured out. Don't worry though, sewing. You're still my main squeeze! Ha ha! I look proper goofy here. I'm pushing my hair back out of the way because it was windy, but I look like I think I'm in a shampoo advert or something. What a dope. Okay, I'm going to leave it here for the evening. Check out Sarah's blog for details of how to get involved in Sew Dolly Clackett. Also, don't forget that there's still time for you to win a copy of the Simply The Best Sewing book! I'm away to watch some Star Trek: The Next Generation. 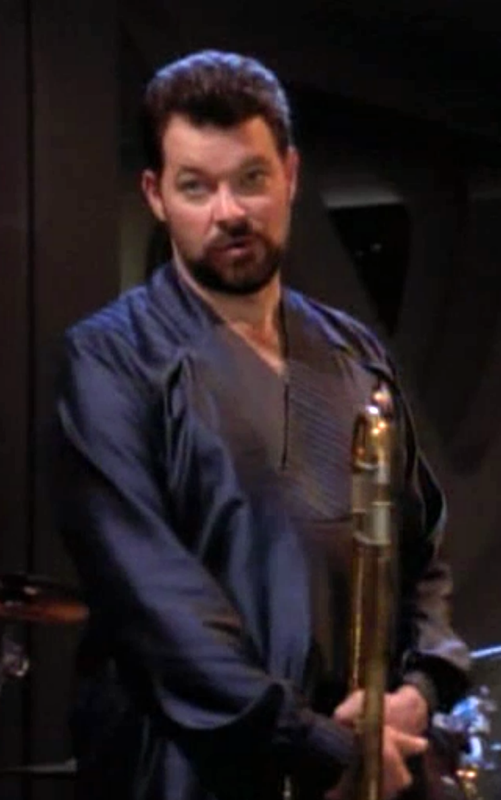 Commander Riker, is that a trombone in your hand, or are you just pleased to see me? I hope it's a trombone. Please let it just be a trombone.